Rickmansworth’s traditional curtain-raiser was against a strong Chorleywood side who only 2 years ago were in the Herts Championship. Ricky meanwhile were missing a few League regulars and certainly showed some rustiness in subsiding to 40/4 in the early exchanges. Taz, Shammi and Ibby all got starts, but with the top 5 all getting out Bowled or LBW, it was either a low early-season wicket, or just sticky footwork to blame. Cooke and Majid are probably two of the cleanest strikers in the side and their resilience showed in a 70+ run partnership which saw Majid reach 51 before being out. Chorleywoods Ryan Tome then made short work of the tail, getting all three for ducks, again LBW or Bowled, to see Ricky subside from 160/7 to 160 all out. Unfortunately a batting performance that won’t win many games in the league this year. Chorleywood played much better with Ryan Evans retiring on 55 and Tom Smithson (38) giving them an opening partnership that was halfway to the target before Zaf got one to scuttle and hit the pads. 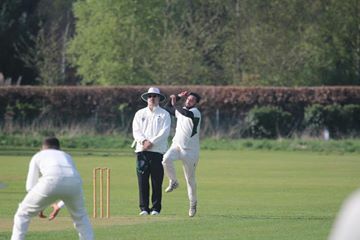 Indeed it was only the spinners, Zaf and Cookie, who took wickets as Chorleywood reached just short of the target 2 down before Zaf grabbed 2 more for a 3 wicket return. A 6 wicket win for Chorleywood was a deserved win as they caught the Ricky batting a little cold. Luckily there are still 2 weeks to go before the league season starts. Chorleywood won the toss and decided to bowl.